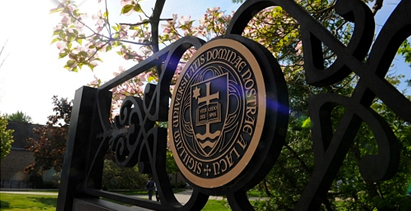 The University of Notre Dame filed a lawsuit Monday (May 21) challenging the constitutionality of a federal regulation that requires religious organizations to provide, pay for, and/or facilitate insurance coverage for services that violate the teachings of the Catholic Church. Filed in the U.S. District Court for the Northern District of Indiana, the lawsuit names as defendants Health and Human Services Secretary Kathleen Sebelius, Labor Secretary Hilda Solis, Treasury Secretary Timothy Geithner, and their respective departments. The federal mandate requires Notre Dame and similar religious organizations to provide in their insurance plans abortion-inducing drugs, contraceptives and sterilization procedures, which are contrary to Catholic teaching. It also authorizes the government to determine which organizations are sufficiently “religious” to warrant an exemption from the requirement. Notre Dame’s lawsuit charges that these components of the regulation are a violation of the religious liberties guaranteed by the First Amendment, the Religious Freedom Restoration Act and other federal laws. “This filing is about the freedom of a religious organization to live its mission, and its significance goes well beyond any debate about contraceptives,” Rev. John I. Jenkins, C.S.C., Notre Dame’s president, wrote in a message to members of the campus community. “For if we concede that the government can decide which religious organizations are sufficiently religious to be awarded the freedom to follow the principles that define their mission, then we have begun to walk down a path that ultimately leads to the undermining of those institutions." Notre Dame’s lawsuit was one of 12 filed Monday against the federal government by 43 plaintiffs challenging the constitutionality of the regulation. Father Jenkins’ message and the lawsuit are available online. This is part of the above article. Check out link for news. And, Father Z is keeping track of the updates on the list of those joining the suit. Praise God for this awakening. As an ND alum, I am glad for whatever reason the university is on the list. The bishops rejected a compromise brokered by Mr. Obama in February in an effort to defuse the conflict by having the insurance companies — not the Catholic employers — pay for and administer the coverage for birth control. When some Catholic organizations broke with the bishops and greeted the accommodation positively, the bishops resolved that Catholic institutions must present a united front. 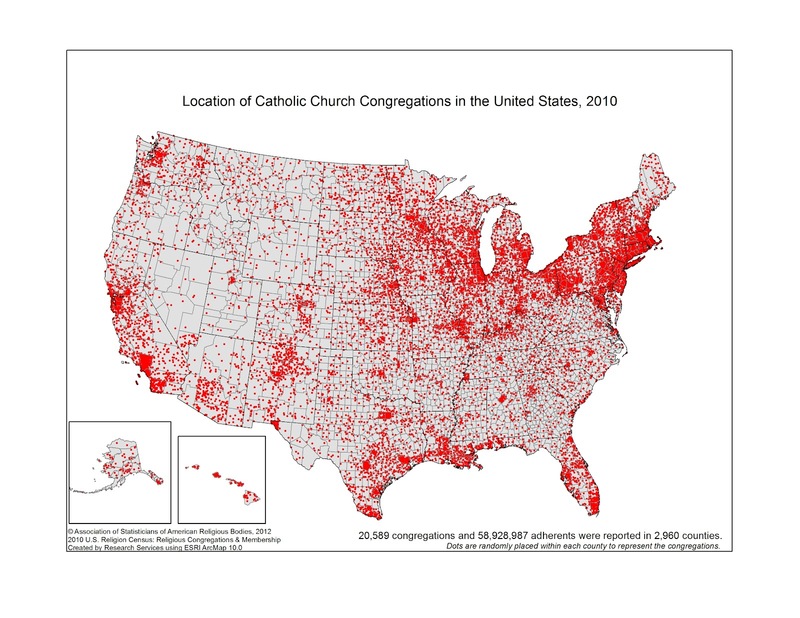 Among those filing suit are the Archdioceses of New York, Washington, D.C. and St. Louis; the Dioceses of Dallas, Fort Worth, Pittsburgh, Rockville Centre on Long Island and Springfield, Ill.; the University of Notre Dame and the Catholic University of America; and Our Sunday Visitor, a Catholic publication. All the plaintiffs are being represented by the law firm Jones Day. To me, fairy tales, (excluding Tolkien, but not Shakespeare) reveal a world of madness and irrationality. Fairy tales represent the unknown mysteries of nature, where the human rational view of the world no longer exists. 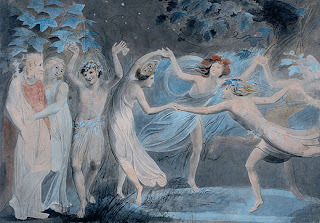 Living in Europe right now is like living in land where the most important thing is dancing with fairies. I can't believe I am writing a post which could have been written in the 1930s in Nazi Germany. The purposeful twisting of language in Great Britain and Europe with regard to political terms has become an explosion in a spaghetti factory. I have been listening to television from several nations, reading articles online and conversing with people. From these sources I have gleaned several serious problems which I want to share, as a heads up. First, there is a purposeful disassociation of the term Socialist. Normal usage of the word is construed by the media and private persons to mean either Centralist positions, or worse, Communism. The original meaning of the word Socialist has been obfuscated to cover so many meaning as to make the word meaningless. Not only is this sloppy journalism, it is done with agendas including the softening of hard-line communists principles now found in most Socialist parties. Second, the reports which refer to "far-left" and "far-right" groupings present various meanings to these terms, which have confused the man and woman in the street. What those of us who are students of history or politics deem as "far-right" would be the KKK, other openly racist groups, fascism and neo-Nazi parties. However, the far-right now includes mainstream, even right to centralist parties which have or want stronger immigration policies. Of course, the term is being misused on purpose. The term is used to cover anti-abortion and anti-gay marriage advocates, as if these people were terrorists. Far-right means in some places opposition to sharia law. That is a completely ironic use of the term. Third, the news gurus also use the term "far-left" in confusing arrays of definitions. In my book of definitions, the far-left would include communists, anarchists, syndicalists, and some socialists. The problem is this. The term "Communist" is taboo in the Euro-zone. However, many politicians, or would be government officials, or even diplomats in the Brussels, Strasbourg, even Frankfurt actually hold communist ideals but are not labelled as such. They are called "reformers", mostly. The term "far-left" is used in an undisciplined manner to include terrorists, as well as political candidates in Greece, who the media refuses to label communists, although that is what the platforms of such persons looks like, when one can actually find substance beneath the rhetoric. The terms "government", "sovereignty", "austerity" and "growth" have been bandied about so much lately that one loses track of the misuses of these terms. At this point in any real political discussion, the terms are meaningless. The left twists austerity into unfair punishment and uses the term growth as if spending will get anyone out of debt. Families know this is ludicrous and if the jobs are not there, if the industries or worse, if the population is gone which would create a strong infrastructure (population problems caused by brain-drains, contraception and abortion, among other things), there can be no growth--that is simply a fairy tale and the media in Europe loves this fairy tale. I am concerned, as in the old days, at least in the English-speaking world, journalists and other writers had a common parlance. It was only the propaganda machines which used language to suit political agendas. Now, we have a state where one has to listen and look closely to find the Truth. I hope the Vatican can avoid slipping into sloppy language, or vague language, which is another post, as this happened last Autumn with the horrible socialist economic leaked paper, and with other documents in the 1960s. If language is corrupted either by propaganda or agendas, or deceit , or narcissism, we no longer can communicate. This is happening very quickly in Europe. If Catholics can save the Truth through the Teaching Magisterium, we need to be very careful about definitions and language. The relativistic onslaught is weakening not only language, but how we think. Thinking needs definitions and clarity. We are slipping into the dance of the fairies. When we cannot trust a common language, we cannot trust each other. We have lost our civilisation's ability to communitcate. I am thinking of two universities which have responded to the Obamacare mandate. The first is Steubenville, which courageously has decided to drop the insurance coverage of the university for students in order not to offer abortion counseling, abortifacients, and contraceptives. The president of the university is on this video from ewtn. online. It worth looking at this and comparing it with the statement of Georgetown's press department regarding Sibelius at the Graduation this weekend. I suggest before the really hard times come, that you think of moving into an area where there are lots of Christians who are living like Christians. I do not think anyone is surprised by this map. 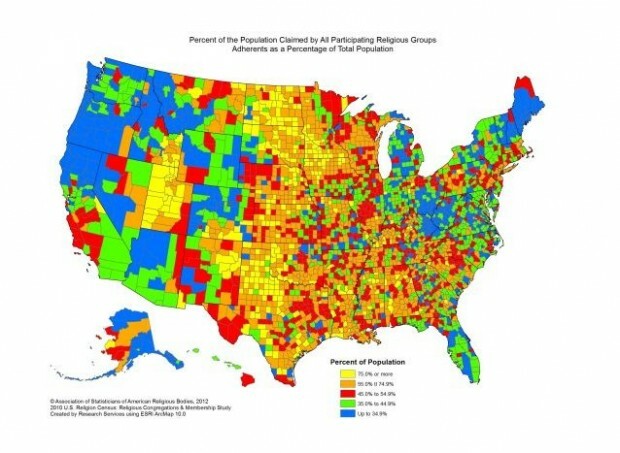 For those having trouble reading the map, yellow is the highest concentration and blue, the lowest.